COMPETITION NOW CLOSED – Thanks to everyone who entered! A caravan or motorhome cover is a great way of making sure your pride and joy is protected when in storage, particularly if the weather takes a turn for the worse in autumn and winter. And they’re certainly very popular with caravanners if you check out the results of our caravan and motorhome cover poll! 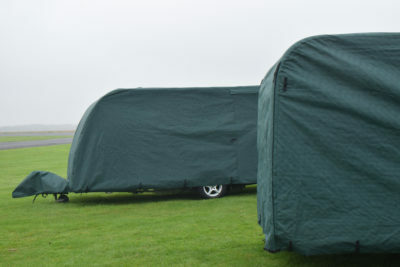 Covers come in all shapes and sizes and are designed to protect your leisure vehicle from debris, strong winds, light hail and water ingress. We’ve teamed up with another Yorkshire-based family business, Pro-tec Covers, and are giving away a caravan or motorhome cover to one lucky reader. Pro-tec Covers are designed and manufactured in Bradford, and will offer all-year round protection from whatever the weather throws at your caravan or motorhome when it’s in storage, protecting against rain, rust, snow, sun, dust, dirt, tree sap, UV fading and bird droppings. They’re made from material which is breathable to protect your caravan or motorhome from mould, mildew and condensation as it allows moisture to evaporate. All their covers are made to measure for many of the big caravan and motorhome manufacturers and come with door access and Pro-tec’s Easy-Fit® System, which makes it easy to get the caravan or motorhome cover on no matter what the size. The back panel simply rolls up and the heavy duty fitting poles provided attach to the fitted D Rings making the fitting of your Protec Covers a doddle! 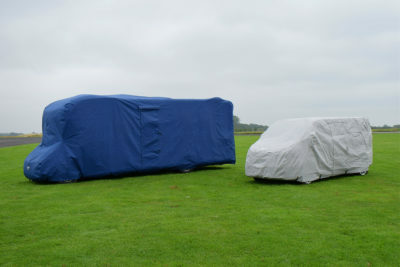 To find out more about Pro-tec’s range of caravan and motorhome covers click here. The winner will receive a Pro-tec Covers voucher to use to buy a cover for their leisure vehicle. No cash alternatives available. If the winner has a vehicle which Pro-tec doesn’t currently have a pattern for, they will need to take their vehicle to the Pro-tec factory in Bradford, for it to be measured. Closing date for entries: 11.59pm November 11th, 2018. Winner details only will be passed on to Pro-tec Covers for the prize to be posted out – not for marketing purposes. THIS WOULD BE GREAT AS I HAVE TO KEEP MINE AMONGST ORCHARD TREES AND THE VAN GETS FILTHY AND COVERED IN FUNGICIDLE GROWTH, ONE OF THESE WOULD SAVE A LOT OF WORK WHEN NEXT USED. Fantastic product and a complete pleasure to do business with !!! I would really like to have one of these covers as I have just bought another caravan and it’s to big for our old cover to fit.hoping I have a change of luck as I have never won anything in my life. Looks very good are they hard to put on and how about heavy wind. Have ordered a full cover after NEC show for our caravan, due for delivery in a months time. Didn’t have one for previous van and took an awful lot of cleaning at start of season. My old cover is in bits after many good years oy use, would love to win this as pension money has to be budgeted,and cant in all fairness warrant the cost of a new one, fingers crossed. Very informative as we have been thinking of a cover for a while.